In Missouri, drivers can be issued arrest warrants for many reasons, including failing to pay fines for traffic tickets. A skilled defense attorney from our law firm may be able to get your warrant recalled and negotiate to have the charges reduced. 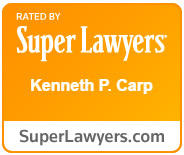 Do not wait to speak with a St. Louis County defense lawyer from the Law Office of Kenneth P. Carp. We offer free initial consultations. Call for yours today: (636) 947-3600. WHY DO I HAVE AN ARREST WARRANT? With more than 20 years of legal experience, our St. Louis defense attorneys skillfully handle arrest warrants for traffic tickets. We can review your driving record and the specific facts and evidence of your case in an effort to have the arrest warrant lifted as well as help you avoid a suspended license. If you were arrested for a traffic offense, you have rights and options. Our law firm can swiftly inform you of those rights and options as we seek the best possible outcome for the situation. If you have a warrant issued for your arrest, or if you are facing a court date due to an arrest warrant, do not try to deal with the problem on your own. Talk to an experienced attorney today to learn your options and avoid heavy fines. Call the Law Office of Kenneth P. Carp at (636) 947-3600 for a free consultation. You can also contact us online.